Sometimes taking the time to live in a home a few years and figuring out what works and what doesn’t is a smart move before jumping into the renovation process. That’s exactly what homeowners Yvonne and David Hananel did with their loft in Manhattan’s East Village. After a little more than two years there, they compiled a list of must-make changes: a smaller staircase, more functional kitchen, quieter master bedroom and new reading loft. Then, they turned to architect James Wagman to create the minimalist gem they’d been waiting for. At the side of the staircase, a metal mirror designed and built by Yvonne is one of the first visuals to greet guests as they walk through the front door or down the spiral staircase. 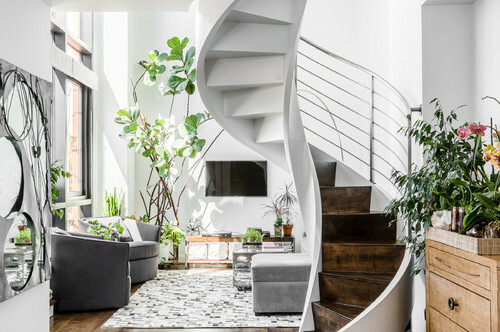 The home’s former staircase was a large industrial number made of blackened steel that doubled back on itself and dominated the first floor. “It was definitely dramatic, but it was also totally oversized for the space,” says architect James Wagman. 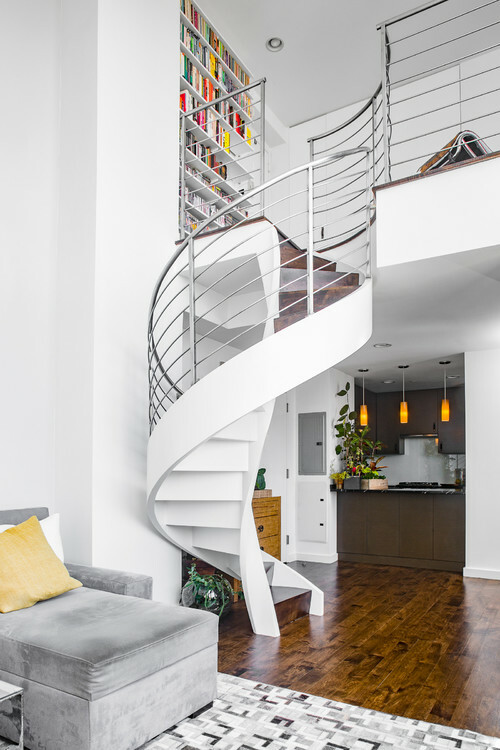 He devised a tight double helix staircase that not only created a sculptural feature for the home, but also resulted in more floor space and a lighter feel more aligned with the overall design aesthetic. After removing the behemoth staircase, Wagman added two thin concrete pillars to support a new overhang lounge on the second floor. To better integrate the pillars and provide additional storage, floor-to-ceiling cabinets were added to one wall in the dining room. The space includes a custom steel table with a glass top, surrounded by four Kubikoff side chairs and two colorful quilted host chairs. Though the galley kitchen is relatively small, Yvonne still likes to cook as often as possible. But first a few important renovations were necessary: A 27-inch gas range replaced a 36-inch model, black granite countertops were added, and resin-coated cabinets were installed. “It might not be very big, but I’m more than comfortable cooking for small dinner parties,” Yvonne says. 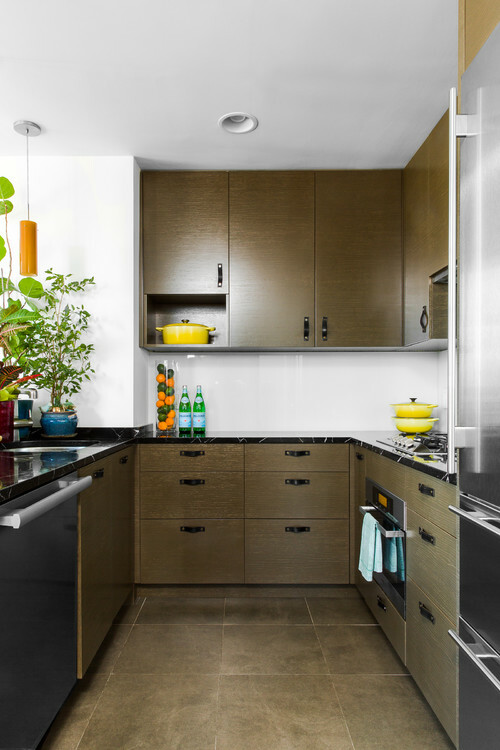 Yvonne added custom leather handles to the kitchen cabinets as an alternative to standard metal hardware. The same handles are also used on the floor-to-ceiling cabinets in the dining room. “It’s the little details that make all the difference,” Yvonne says. The new second-floor lounge has become a favored hangout for Yvonne’s husband, David. “He reads the paper up there every morning. It gets incredible light,” she says. The Le Corbusier LC4 chaise longue was a gift from David’s parents and provides a great spot to relax. Yvonne says she wasn’t above doing a little dumpster diving to score this nightstand. 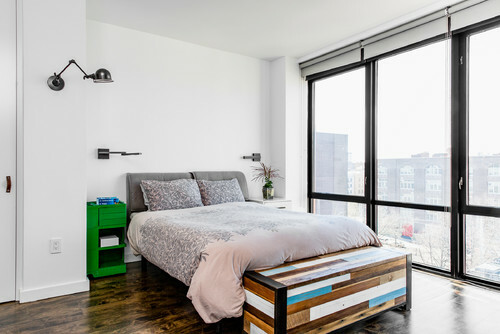 “My old office was getting new furniture, and I saw this small green cabinet in the back alley and thought it would make the perfect addition next to my bed,” she says. The custom storage bench at the foot of the bed is made of salvaged wood and designed by craftsman Jason Hernandez. A door in the outside hallway used to lead directly into the master bedroom. People walking by it in the middle of the night would make for restless nights for the homeowners, so the door was relocated by shrinking the master bathroom to make room for a small entryway. 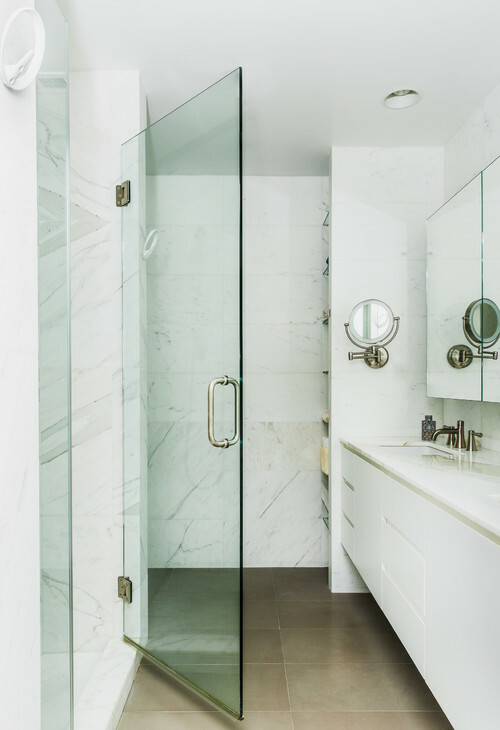 The new master bath still has plenty of room and a sleek feel thanks to its marble walls and floating vanity. There was no room for a tub, so a built-in shower bench was added to offer the option of sitting down and unwinding in the new steam shower.